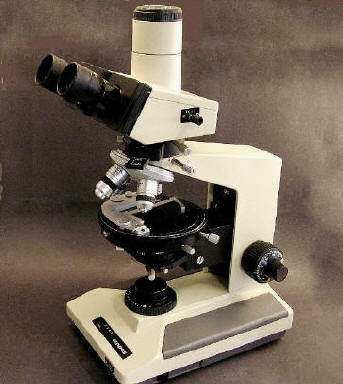 After working, teaching, and playing with most of the student and benchtop sized microscope makes and models from the mid 1960s to 1990s that were available in the USA, my favorites are the various versions of the Olympus BH2. 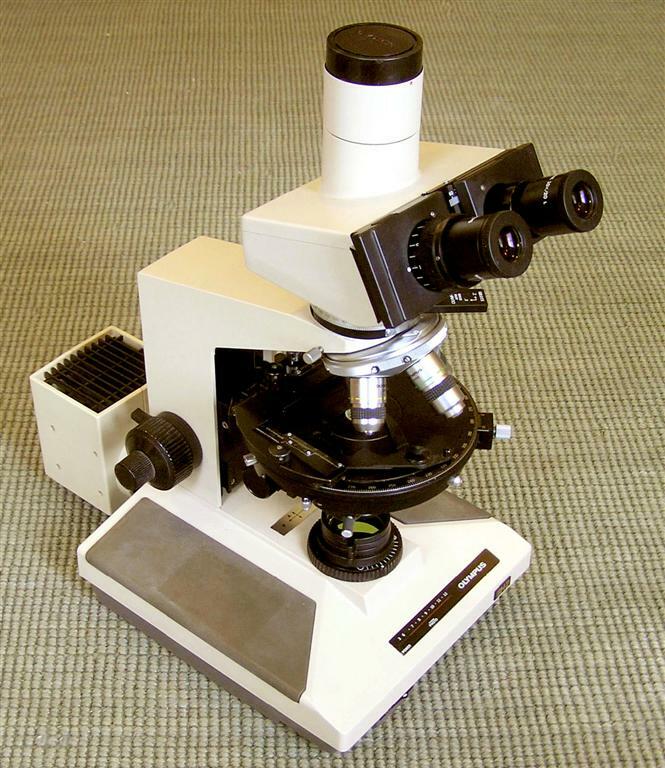 Certainly the other major brands have made very good microscopes with very fine optics, but in the 1980s, none matched the combination of modern style, ergonomics, engineering, quality, optics, durability, and smooth operation that characterize the various BH2 models. Olympus sold a huge number in the 1980s and 1990s; many are still in service, and parts remain abundant. Some other makers copied the general design and styling of the BH2 and its smaller sibling the CH2, even long after after Olympus moved on to their CX and BX designs. Cheap imitations might work OK for a while, but there is no substitute for quality, nor for the pleasure of using so excellent a microscope. In my hobby of renovating microscopes, I enjoy collecting and working on all brands and types that are polarizing, and also the other Olympus models. If only I had space and finances, the best examples would stay on my shelves to admire and use. However, when I am happy with how they look and work, most are sold so I can afford to buy some parts for the next project -- several of which are always awaiting! I have also taken and collected a lot of Olympus microscope photos and documents, and they are posted here as a way to keep them organized and accessible. Please respect that they are for private, personal use only, not for sales or commercial purposes. BH/BH2/CH/CH2 microscopes are relatively easy to service, and their high quality means they can stay in great condition even after years of use. I ought to know, as I have had more than 50 different "pre-owned" examples (lost count some time ago) in my shop. 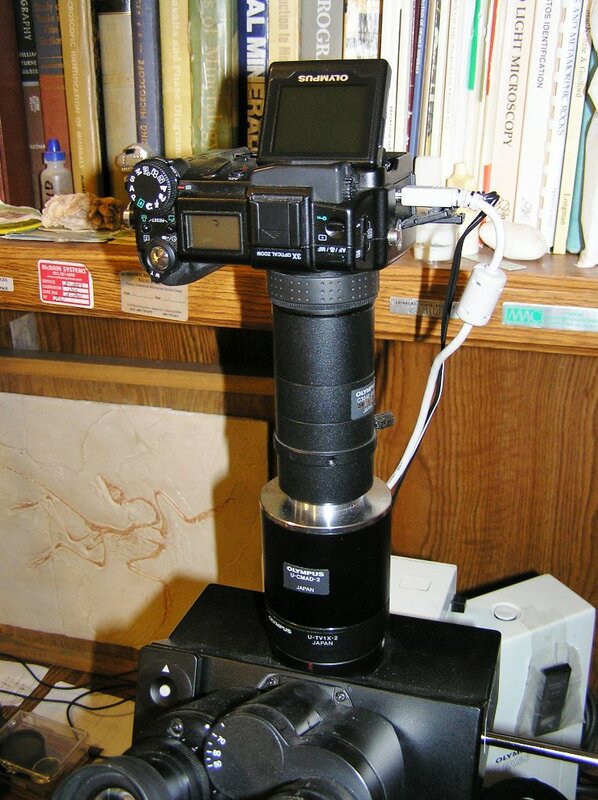 Photos of some of my Olympus microscopes and their parts, and my collection of documents and web links about Olympus BH2, CH2 and related models, are shared on this page. Also see my wonderful BH2 BHSP and other descriptions of Olympus microscopes (among other polarizing models) on my Geological Microscopes website. My particular interest is in petrographic polarizing microscopes, and so some extra attention is paid to Olympus pol versions on this page. Olympus developed the BH2 from their BH series of the 1970s. The company also built a similar but slightly smaller, simpler, and less expensive line called the CH (later CH2), which was designed for the education and clinical markets. The earlier Olympus lines of EH, FH, POM, and other microscopes were nothing like the BH -- it was a completely new design, not a transition. Olympus adopted a modern style of boxy base, riser, and arm for the BH stand, and it is quite large relative to contemporary models by other makers. This allowed interior space for electrical and optical parts, and people like me appreciate the room for large hands around the knobs and controls. A variety of removable modular parts adapt the same stand to different applications -- not a new concept, but an important one. The earlier BH and CH stands had an utilitarian "warm gray" semi-metallic hammered finish, which in my opinion, detracted from the otherwise fine design. The "Olympus beige" color of the BH2/CH2 models is much more successful, and likewise copied by others. The general form of the BH was preserved in the BH2, and also its 160 mm tube length, head design, focus mechanics, some intermediate tubes, reflecting light accessories, removable nose turret, etc. It is possible to swap some of those parts between the BH and BH2 models, but new lines of eyepieces, objectives, and condensers were developed for the BH2. Its new "long barrel" objectives have 45 mm focal lengths, and new eyepieces provide final corrections of chromatic aberrations with the objectives; you should use them together. The BH2 also had new lighting with halogen lamps. Obviously, a tremendous effort went into the BH, and then more into the BH2, and it was all very well done. 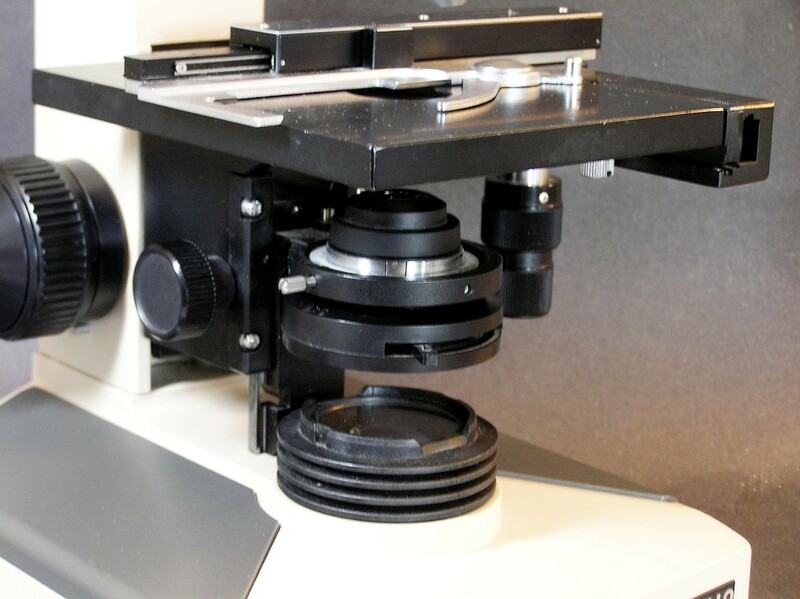 "With the BH Modular Series, launched in 1974, the microscopes could be transformed to meet various specifications, including polarization, phase contrast, differential interference, and simple transmission fluorescence microscopy. The previous E and F Series of microscope bodies and the POS and POM models were specialized devices with more restricted uses or specifications. The BH Series, however, could be used for a wide variety of observations simply by switching the microscope head or lens modules. The BH Series was also the first Olympus product to feature a coaxial handle attachable to the left of the plane stage, which allowed the stage to be easily moved on a vertical or horizontal axis. Olympus launched the BHA and BHB models for research and test purposes, whereas the BHC model was meant for test and practical study. The BH Series was subsequently developed further into the BH2 and the BX. 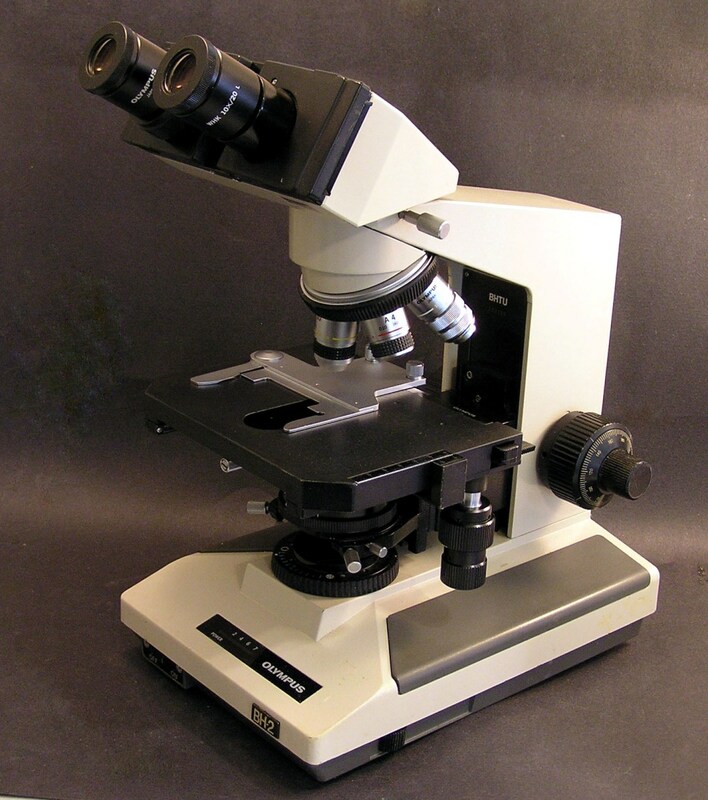 "In 1976, Olympus launched the CH Series, a modular biological microscope for practical laboratory teaching applications, in place of the KHS, KHC, HSB, and HSC. The CH Series could meet diverse needs because of its excellent performance and modular design. The Series comprised three models: the CHA (6V 10W halogen light source), CHB (20W tungsten light source), and CHC (the mirror CH-MM or the CH-LSK 20W with a simple illumination device). The Series was painted in a warm gray color. 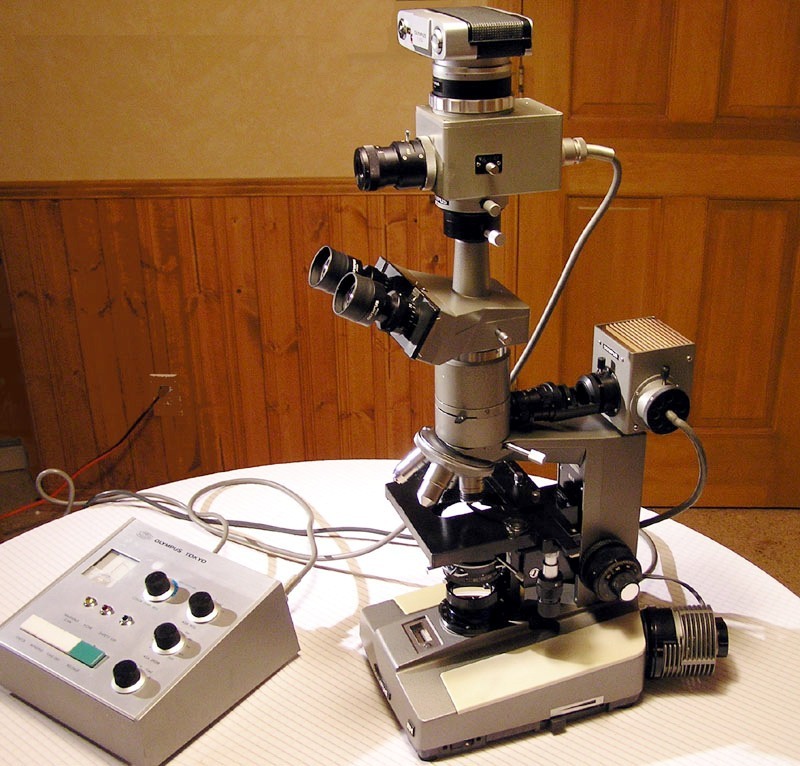 By switching modules, the microscope could be used for simple polarization, drawing, or incident light (metallurgical) microscopy. The CH Series used the same modules as the BH Series. The CH Series was marketed for 10 years, until the release of the CH2 Series. "The BH2, from the high sales volume BH series, debuted in 1980. The company developed the BH2 Series ahead of the AH2 Series, building a microscope that approached the optical performance of overseas products and provided even greater freedom in modular combinations. 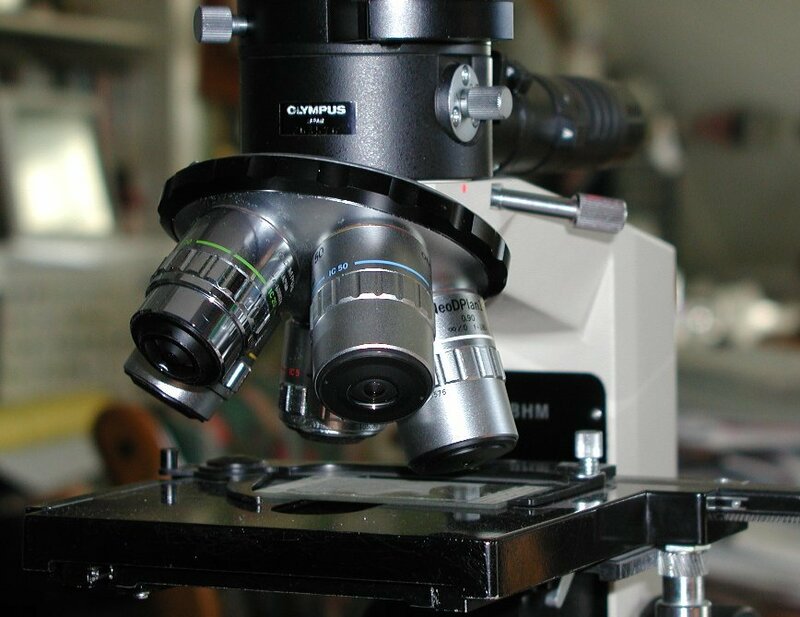 The objective lens can be described as the heart of a microscope. Until the BH2 Series debut, microscopes tended to have short barrels, with a focal length of 36.65mm and a mechanical tube length of 160mm. Olympus then developed a long barrel (LB) objective lens series (1x–100x oil) with a focal length of 45mm and a mechanical tube length of 160mm that could be used for everything from regular bright field observations to polarization, fluorescence, and phase contrast microscopy. As a result, the BH2 Series captured the highest share of the global market. 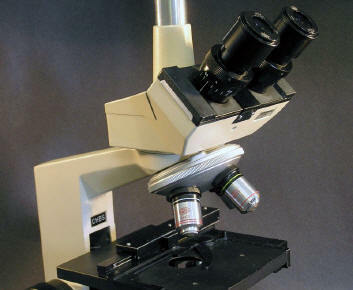 The company's main microscopy revenue stream was therefore on more solid ground. In 1981, Olympus developed the IC Series featuring an LB objective lens for industrial applications and the universal vertical illuminator UMA for additional industrial applications. The company then developed further improved models for the BX and CX Series, utilizing a UIS objective lens. 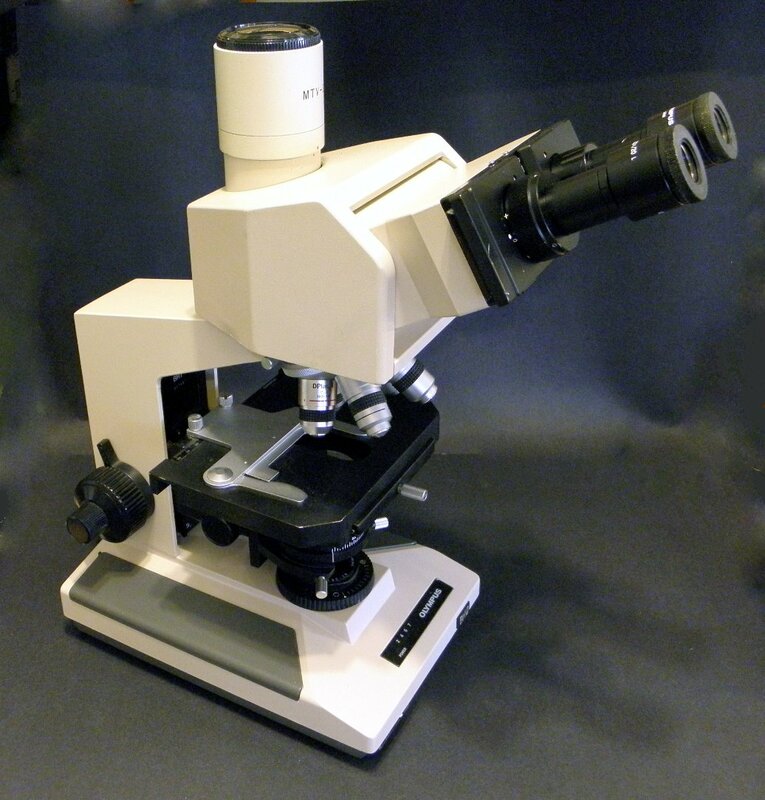 "The BX Series (BX40, BX50, BX60), launched in 1993, used a novel Y-shaped design for the microscope body. The series featured superior operability, excellent rigidity, and first-class optical performance. A wide range of accessories was also available to expand the range of observations possible. Olympus succeeded in providing the optimal viewing environment for all observations. 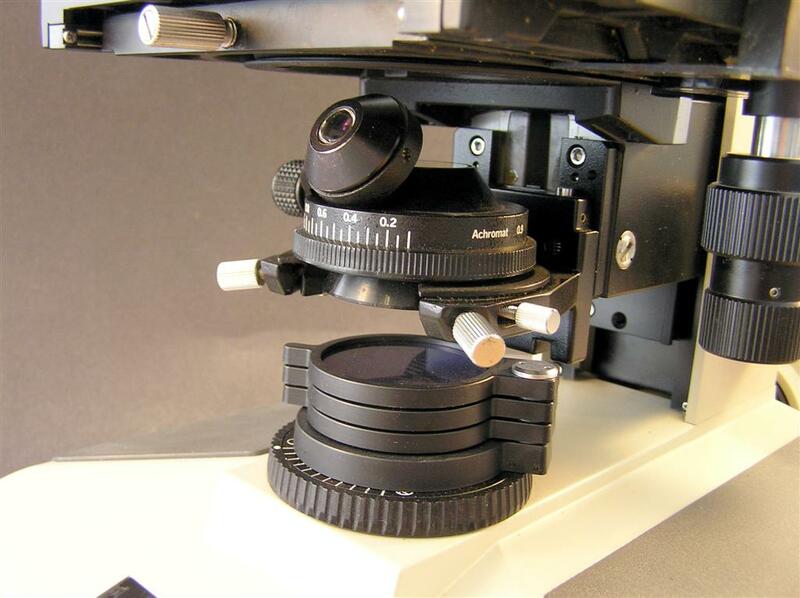 At the same time as developing the UIS objective lens, Olympus worked on designing a Y-shaped microscope body in a bid to further evolve the AH2, BH2, and CH2 Series and establish a global leadership position. There was heated debate amongst the developers from the concept generation stage, but unstinting efforts and expertise by the development and manufacturing divisions resulted in the debut of this product with the tagline "Yes is the answer." YES is an acronym for Y-shaped ergonomics, Excellent optics, System versatility. This product range took the competition by surprise and was extremely well received by microscope users." Olympus now makes their CX line of microscopes in the Philippines, and some components for other models are made there and also imported from China. Otherwise, Olympus maintains a heritage of very fine Japanese microscope designs, construction, and superior optical quality. The BX line has already progressed through the BX2 series and now (late 2011) the BX3, which to my eyes looks like something designed for the Star Wars movies. Interestingly, it appears that parts for polarizing models have continued essentially unchanged from the initial BX models. Recently there have been more parts and whole microscopes of the BX series on eBay, so as time goes by I will add these to my webpage. I now have a BX-50 polarizing microscope to restore and possibly use for research, so I am also collecting BX documents (both microscopes are in this photo). I have assembled a collection of Olympus adapters and cameras for them, which work very well. In general, BH2 stands are durable and easy to work on, and if they have seen normal use and maintenance, you can usually assume a used one can be cleaned up to give you many more years of reliable service. If you need some parts, you can generally buy another used BH2 with what you need, and cherry pick the best pieces to make one good microscope out of your two not-so-good scopes. Then clean up and resell what you don't need on eBay. A few BH2 and CH2 stands have come my way with electrical faults and bad coarse focusing gears, but such problems appear to be rare. I am amazed by the amount of dirt that often arrives on used microscopes, not to mention the stupid stickers, tape, and magic marker labels. 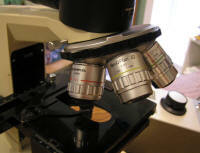 But with patience and the right cleaning agents, a quality microscope can be made very nice, if not like new. Chips and scrapes in the enamel paint of the the stand are also common. Not having found an exact match of any commercial paint for the Olympus Beige, I mix a close match using little jars of Testor brand model enamel paint, which requires white with a bit of brown and yellow, and maybe a few other colors. The beige color of Olympus BH2 and CH2 stands is not always exactly uniform among examples I have owned. You can probably find a decent working BHT version on eBay for around $1100 to $1400 or so, complete with four DPlan objectives and perhaps even a trinocular head (worth at least $200 more than the binocular head). The BHTU version is less valuable by $200 or more, although it was supposedly available because of higher demand for the tilt-inward design of the turret. The swing-up top lens BH2-SC condenser goes for about triple the price of a standard Abbe, and even more is asked for the Aplanatic (AAC) condenser. In fact, the standard and common CD Abbe condenser is satisfactory nearly all the time. However, if you want to get good use from low powers such as the 2x and 4x objectives, go for the swing-top SC version, as the low n.a. with the top lens down helps to illuminate the whole view. There was also a special condenser called the BH2-ULC to use with 1x and 2x objectives. For high power viewing the Aplanat can't be beat, but match it with SPlan or Apo objectives if you can afford them. "D Achromat" (labelled "A") and DPlan objectives, and both WHK and WK eyepiece versions are reasonably abundant and relatively affordable, and they are excellent. SPlan objectives can be half again to twice as expensive as DPlans, and the Apochromat optic lines are still sky high (but no doubt worth it). Versions of plain achromat and D Plan objectives with a special PO label on them are certified strain-free for polarizing techniques, and they are even more expensive then the SPlans (which are not available with PO labels). However, my colleagues and I find that "normal" biological A, DPlan and SPlan Olympus objectives show little to no obvious strain effects, so go ahead and use them with polarizing filters (the SPlans also have higher resolution and wider plan focus than the DPlan PO versions). Phase contrast objectives should be good too, but probably the Apochromat objectives are problematic for polarizing use due to all those interior lens layers, although having never owned any, I don't know this personally. The DPlan objectives work great with standard wide-view 10x eyepieces such as the WHK and WK models, which have an excellent field number of 20. But if you are lucky enough to have one of the rather rare super-wide heads with their 30 mm diameter FN 26.5 SWHK eyepieces, the SPlan objective line is designed to provide flat focus across that extreme view field. You also might wish to use them with the swing-up SC condenser. Some folks mix and match Olympus BH2 optics with parts made by Nikon for their Labophot/Optiphot and later 160 mm mechanical tube length models. They have generally similar performance parameters, but of course Olympus and Nikon will tell you how their objectives and eyepieces are made to work together for the best corrections of color aberrations and planar focus. I'm sure it's true, but whether you will notice or care much is up to you. The condensers for the two makers appear to fit each other's stands, and surprisingly, so do their removable stages. On eBay you will find many more parts and accessories for the BH-2 than for Labophots and Optiphots, no doubt a reflection of sales volumes. I try to stick with parts original to my microscope models, although it is not always easy. 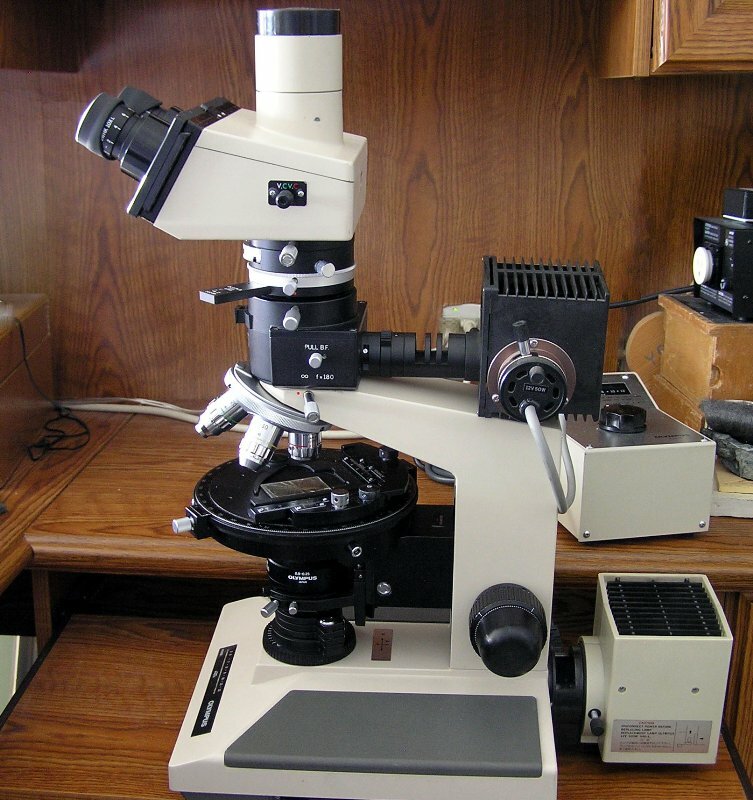 As far as my "new" BX50 polarizing microscope (late 1990s), I find it has really excellent optics and a great big conoscopic image, but I am concerned about all the electronic components and their potential for expensive failure. And parts are expensive! The surface-mount electrical parts of the BH2 can be serviced or else if necessary, it is easy and relatively cheap to buy another stand for parts, and to swap out the light-source base. In the sections below are images of various BH/BH2/CH/CH2 microscopes and parts that I have owned, and kept or sold over the years. There are also versions that I have not yet seen, and if you have other images or documents to share please share them: I am happy to acknowledge your generosity. In addition, there are pdf files of sales brochures, catalogs, and instruction manuals that I own or have borrowed, including some for other Olympus models. These are for your personal information only, not for sale or commercial use including eBay. Several photos from this page have been taken recently and used on eBay -- a fraud, as they do not show the item actually for sale. If you see someone stealing a photo for their profit, please let me know. Click on the image thumbnail for a larger version, on a web link, or on the document name to download a pdf (warning: it may be a large file). 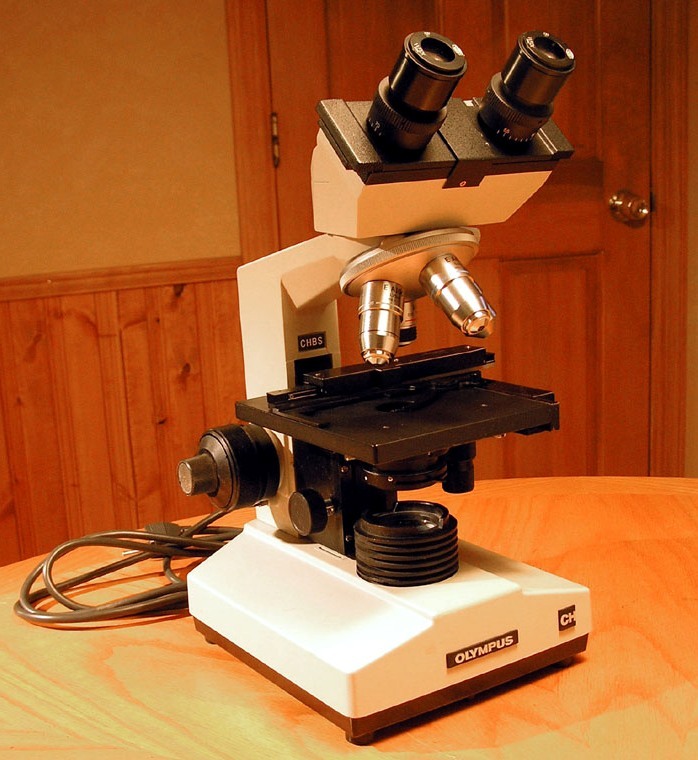 I enjoy hearing from folks who use these microscopes, and if you have some suggestions or contributions for this web page, please contact me. The BHA had a more powerful bulb in an attached lamp house. plus a built-in output and switch for a second lamp in the incident light tube. It also had an internal swing-up lens to be used with higher power viewing. The BHA uses the LS30 or 30-watt lamp built into its holder, and plugged into a metal lamp house to dissipate heat. The internal transformer handles both lamps. The BHC model had a somewhat less powerful 15 watt lamp in a holder assembly like the one used for the BHA, plugged directly into the back of the base. For dedicated reflected light work, the BHM used a simplified base without transmitted light capabilities, and an external transformer. This newer BHM is based on the BH2-style stand and has big "neo" objectives, which are optimized for reflected light. The TF transformer puts out 30 watts, but 50 or 100 watt models are also available. This example has a very rare trinocular tilt-head. I use it for examining opaque "ore" minerals in rock sections. The CHA-P or polarizing version had the same pol accessories as the BHA-P with some modifications to fit the smaller frame, and it had to be ordered from the factory. Its halogen lamp is only 10 watts but appears brighter than the 30 watt tungsten bulb. The CH-BS was marketed for education. The CH line started in the "warm gray" finish like the BH stands, but before the CH2 model was in production, CH stands adopted the beige finish as used on the BH2. A nifty clam-shell style hard plastic case was available for storing and carrying the CH microscopes. There was also a larger hard case for the BH2, but the older BH series still used old fashioned wooden cases. CH2 CHT biological binocular microscope. This example is outfitted with D Achromat objectives and WHK 10x eyepieces. The eyepiece tubes here are inclined 30 degrees -- more common was a version of the head with 45 degree tube inclination. CH2 CHT back plate. Two lamp types were built into the base: a 20 watt halogen, or this one, a 30 watt tungsten filament bulb half silvered inside for reflection. The CH30 model of the 1990s was a transition, with the new CX stand style but the 160 mm optics of the CH2, and still made in Japan. It was very nice to see the high construction quality continued. However, it has sharp edges and corners where the finish can easily chip. The new lines also have CX20 and CX40 versions. 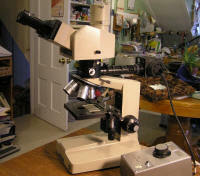 BH2 BHT biological binocular microscope with a BI-30 binocular head. The BHT has a removable nose turret on a sliding dovetail, like the BHS. Lighting is by a small plug-in 20 watt halogen lamp house in the back of the base, powered by an in-base transformer. The very rare tilt-tube head is large enough to look a little awkward on a normal BHT stand, but it is really nice to adjust the viewing to a comfortable angle. This one has an "MTV3" accessory tube attachment. BH2 BHTU biological binocular microscope. Similar to the BHT except it has a non-removable nose turret that rotates the objectives inward, allowing more room over the stage for hands. I believe this version was intended to satisfy a preference of users in the U.S. clinical lab market. This Olympus measuring eyepiece looks like an older vintage, but it works fine with the BH-2. There are two graduated lines that you move to measure dimensions in the sample view. BH2 BHSP, set up with the larger 165 mm circular stage BH2-SRP and intermediate tube BH2-PA (see below). I have described it in more detail on my geological microscopes webpage. The BHS only differs from the BHT stand by its wider base with a 100 watt light source. BH2-PA intermediate tube for petrographic microscopy, with a rotating graduated analyzer, focusable Bertrand lens, and a slot for a 6x20 mm compensating wave plate. The 4-place nosepiece BH-PRE includes 3 centering places, which use a special wrench or small screwdriver. Other polarizing optical parts include DPlan PO objectives in a 4-place PRE nosepiece, and a POC flip-up condenser with a rotating polarizer filter built into the base. The wave plate is used in the PA intermediate tube. This BH2 BHT is a "cross-over" ready for both biological and geological uses, with a KPA tube sliding analyzer, centering turret, circular stage, and removable tube-type polarizer on the field lens. The Optovar tube has a Bertrand lens and 3 magnification lenses. Wave plates for the BHTP and BHSP, top to bottom: Berek tilting compensator; quartz wedge by Nikon (6 waves); whole-wave 530 nm; and quarter-wave 147.3 nm. They are often priced higher now than their new cost in 1992. BH2 BHS for biological bright field applications, with TR-30 trinocular head, a right-hand SVR stage, and SPlan brightfield objectives. The SPlan objectives have enhanced numerical apertures and planar views up to the FN 26.5 of the super-wide head and SWHK oculars. The BHS-LSH lamp house uses a 100 watt halogen lamp powered by a transformer in the base of the stand. There is a slot for a glass filter in the short connection tube. My personal BHSP with a reflecting light attachment, powered by a 50 watt lamp and TGH transformer. I usually use MSPlan objectives for both transmitted and reflected light observations in this system, and they are fine with the super-wide head as well. 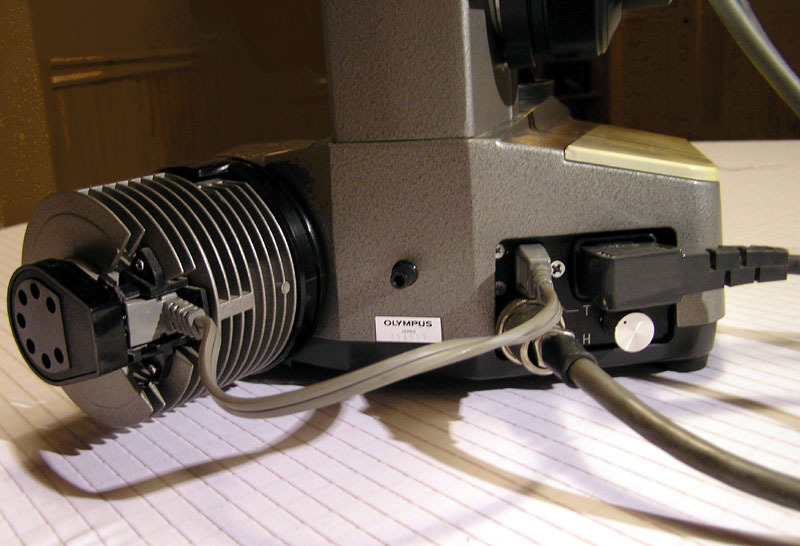 The BX50P (left of the BHSP on my desktop) was introduced in the mid-1990s, with new pol accessories such as a large attachment with the Bertrand lens, which gives a larger and better interference figure. The Olympus C3040-ADL adapter fits the 41 mm filter thread of several Camedia camera models, and it matches BH2 optics perfectly. The C-4040 4 megapixel camera seen here works well with the adapter. 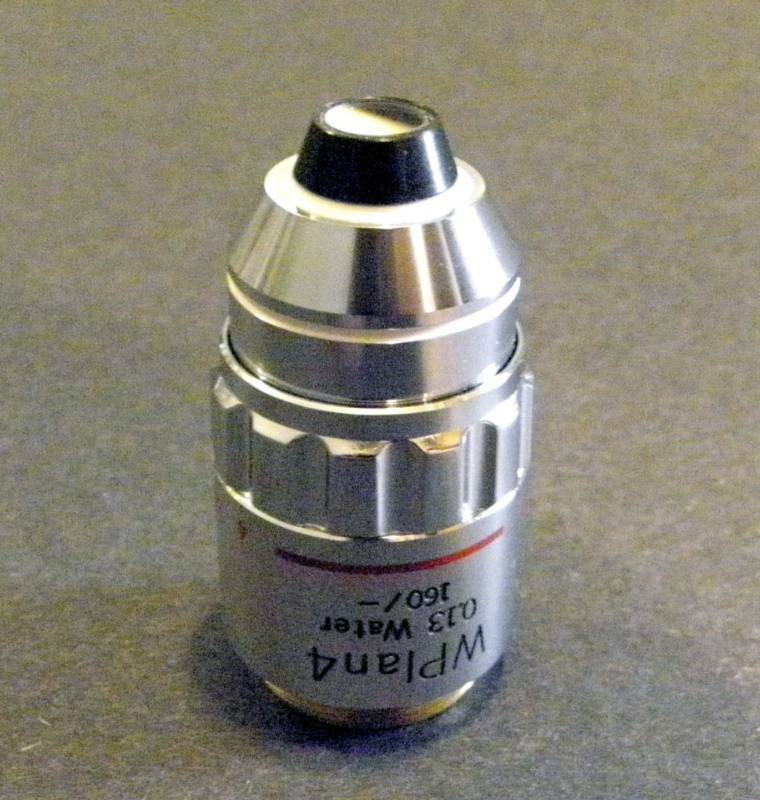 You also need a c-mount adapter tube such as the MTV-3 or U-PMTV (seen here on a BHSP). Add a remote shutter control and power adapter to make an excellent photomicro system for the BH2. Mounted on my BX50P is an Olympus 5 mp C-5050 digital camera, screwed to a C3040-ADU adapter and attached to U-CMAD-2 and U-TV1x-2 tubes on the trinocular photo tube. An infrared remote shutter controller is velcro-ed next to the left eyepiece tube, and camera focus matches the ocular focus, so I can snap images without looking up from the eyepieces. The camera has a flip-up view screen for checking the image as well. A video cable runs to an old laptop nearby, to easily download and review images (not a live view). It all works very well. Olympus replaced the C-5050 camera with the C-5060, which has a larger lens with a 48.5 mm hood thread (the movable lens has a 41.5 mm thread). There is a very rare C5060-ADU adapter to fit this and also the similar C-7070 7 (7-megapixel) model. The C-8080 and later cameras have another size and I don't know if there are Olympus-brand microscope adapters for them. See the excellent descriptions by Alan Wood about adapting digital cameras to Olympus microscopes. CH2 substage, with an achromat or "Abbe" condenser in a non-centering ring holder, similar to CH and BH condensers and holders. The high 1.4 n.a. aplanatic condenser for the BHA used built-in centering bolts, as the ring holder for it had none. The BH2-AAC aplanatic condenser uses 7 elements for its 1.4 n.a., a good match for high-n.a. SPlan and Apo objectives. But not so good for fully illuminating low power objectives. The 2-element achromat or Abbe n.a. 1.25 BH2-CD condenser is the common type, in the nice BH2 centering dovetail holder. The BH2-SC condenser with a swing-up top lens allows easy change between n.a. 0.16 and n.a. 0.9, very helpful for fully illuminating low power views. Beneath it is a clip-on holder for three swing-out 45 mm filters. Older-style short barrel (36.65 mm) objectives were carried over from earlier models, and used in the BH and CH lines. Their optical quality is very good. EA objectives, developed for the education market. Advertised as more economical yet good quality optics, especially for the CH2. D Achromat objectives, a somewhat more economical line of "long barrel" or 45 mm focal distance objectives developed with the BH2. Also used in the CH2. The DPlan or plan achromat objectives are most commonly found on the BH2. Olympus calls them "long barrel" for their 45 mm focal length, replacing earlier 36.65 mm length objectives. SPlan objectives have shinier barrels than most of the DPlan line. Also higher numerical apertures (except for the 100x), and they can maintain planar focus up to 26.5 FN. MSPlan (metallurgical) objectives also fit the standard 20.3 mm turret holes. There is also a MDPlan line. Incident light passes down through them to the sample but they also work fine for transmitted light. Note the nice high n.a. values. The large "Neo" objectives are optimized for reflected light, in DPlan and SPlan lines up to 150x. They require a turret with 25 mm holes. The Plan Water immersion objectives are very rare and expensive. This 4x is useful for watching little creatures swimming in a drop of water. 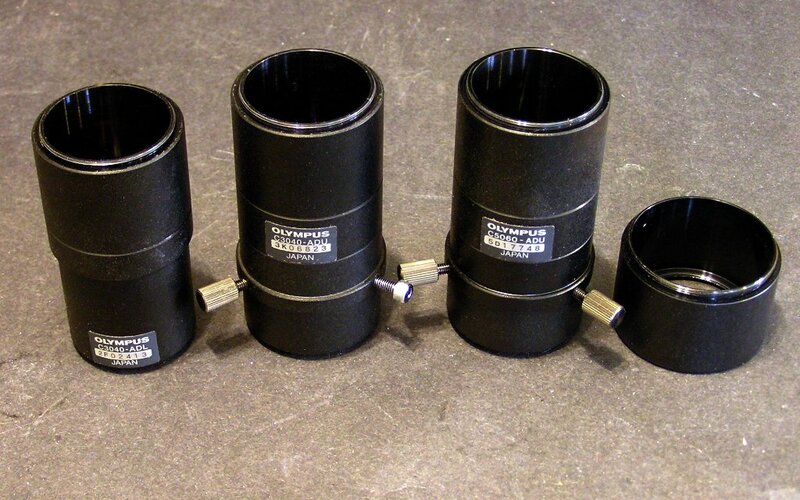 CWHK eyepieces, commonly used with EA objectives on the CH-2 model. They have a slightly smaller field number or width of view than the WHK line, 18 vs. 20. The WK eyepiece line is similar to the WHK, but without high eye-point, and with rubber eye guards rather than a sliding tube. The right one has a cross hair reticule, often for a polarizing scope. The WK line was also used with the CH2. 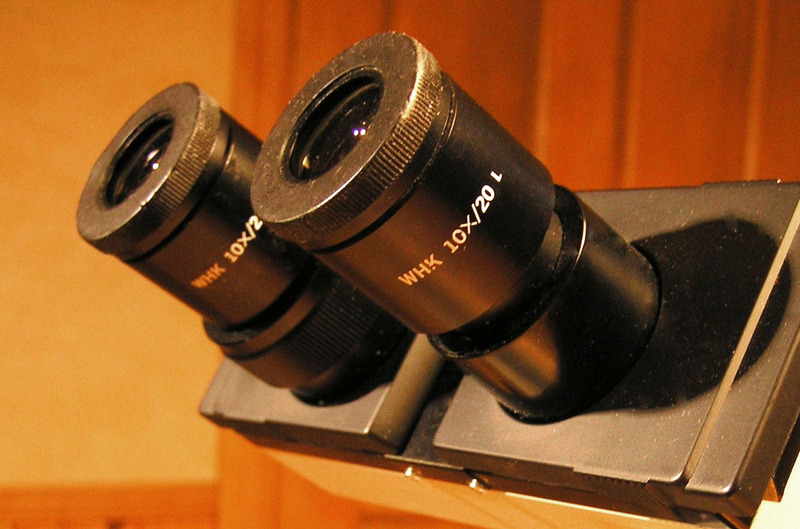 WHK 10x eyepieces are the most common for the BH2. They have a wide field number of 20, and the upper barrel tube sections can slide up to match your eye-point level. There are four different powers of the WHK ocular line: 8x, 10x, 12x, and 15x. Each has a different field number, but only two have f.n. labels. The 30 mm diameter SWHK oculars are used with a super-wide BH2 head with FN 26.5. They all have helical diopter tops for individual focusing. The one on the right had a photo reticule that I replaced with a cross hair. Different powers of NFK photo relay lenses compose different image sizes for your camera. There is also a 1.67x LWD power that remains in demand for digital imaging, so now it goes for high prices (I can't afford it, anyway). I am told this dispersion staining objective was made by McCrone labs from an Olympus 10x. It has six different stops on a wheel for a variety of powers and particle studies. There have been several different DS objectives, and they are still made and sold by McCrone for the new BX microscopes. Olympus made the C3040-ADL adapter to connect certain Camedia consumer cameras to the BH2, for example this C-4040 camera. An MTV-3 or U-PMTV c-mount tube connects it to the TR30 head, and zoom and shutter can be controlled by an infrared remote. The camera and its accessories are easy to come by on eBay, but the Olympus adapter tubes can be expensive and hard to find. Some of these excellent Olympus Camedia cameras have a flip-up view screen, easier to see for focusing. The C3040-ADU is similar to the -ADL screw-on adapter (41 mm) but was made to use with the BX line of infinity optics. The C5060-ADU adapter is the same as the C3040-ADU but adds a 32-mm deep step-down tube (right) to fit the 48.5 mm thread of the C-5060 and C-7070 cameras. I am lucky to have them to play with!